Your best friend throws, like, the most totally tubular theme parties in town . . . Fright Night, Alice in Wonderland, Great Gatsby, it’s a never ending stream of fun ideas that have everyone dressing up in costume for another gnarly night. 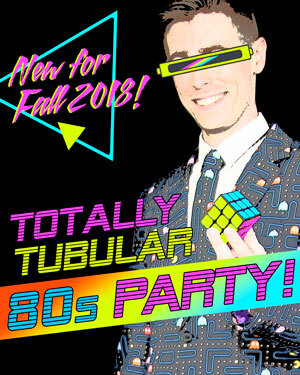 And tonight’s the “Totally Tubular 80’s Night.” You head over in costume ready to dance out your Pacman Fever, but, whoa, the night was just a bit too bodacious for your own good. Friends, you have partied so hard, you interrupted the time-space continuum and you are now STUCK in 1988. Dude! You have to get back in time for work on Monday and that means you all are going to have to get to some problem solving. You need to figure out how to open up the time portal and zoom back to present time before this party gags you with a spoon.